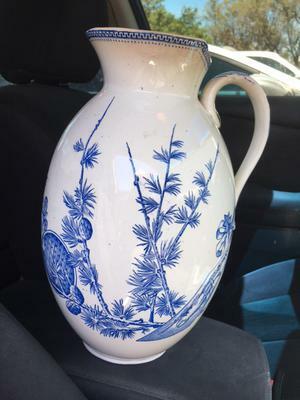 Hello, I just began collecting interesting blue and white pottery pieces. I am new at identifying marks but have been pretty successful up until now...this one stumps me. I believe it may be Scottish only because of the "garter" style that seems to be consistent with the Scottish potters. From what I have read, I believe the "JAVA" would be the pattern name but I have been unsuccessful in finding any mark similar to this. I did find a mark with "Java" along with “Victoria Pottery L&co” but that mark is not even close to the one on my jug. I also believe the pattern is consistent with the Aesthetic Movement and may be "transferware". I would appreciate any feedback, as I mentioned at the start I am brand new to this. 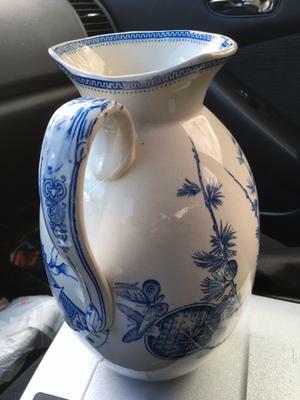 As a matter of fact, I almost began to think that this jug may not even be old that it may be a reproduction...except that I cannot find anything on the net that looks like mine at all. I have looked at 1000's of images of pottery jugs online and have not even found any other jugs with the same shape of the body or the mouth. The jug is very heavy and just over 12 inches in height. Please, any information will be great. Comments for Please help ID a Garter type mark with F.J.E on large transferware jug. This mark is completely unknown in my book sources and online sources at the moment (unless I am looking in the wrong place). It is typical of Stafforshire garter marks of the 19th century, but most of these are well documented - and it is not a hard combination of letters to search for. I got absolutely nothing. The crazing looks a little bit like it was put there deliberately in the firing. Real crazing put there by time is often more irregular in nature. This may be from one of those Italian sellers offering reproductions of the old English look. Just saying. We have had other examples in this ball-park. Let's see what we get in to either confirm or refute that idea. I too have an FJE garter mark, this time on a very large heavy oval platter. It is definitely not repro ,and I would say early to mid 19th century- it is in shades of sepia on white, but the pattern is the same so I reckon Java is the pattern name. I think this is Francis J. Emery. I checked the Goddens listiong for this company and yes, I missed it in my search. Mainly because there was no picture, only words - that's my excuse anyway. They used marks incorporating the 'FJE' initials (just like the one shown above by Kim), sometimes with the name of the pattern, sometimes with the word 'England'. They were based in Burslem Stoke-on-Trent and were around only from 1878-1893.